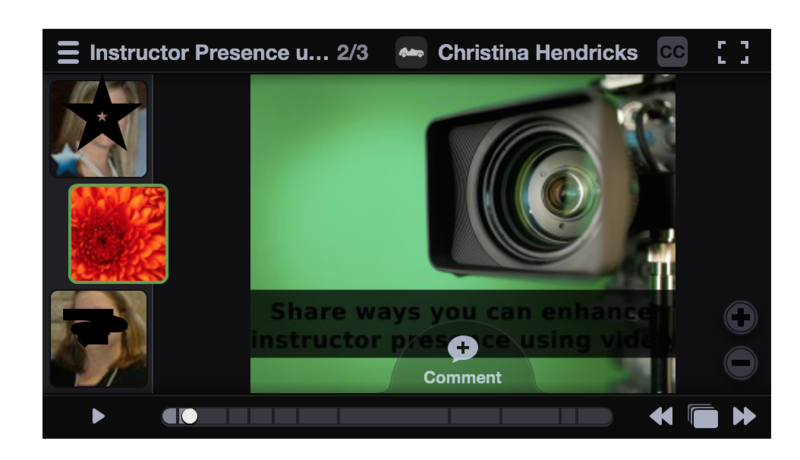 I’m trying to participate here and there in #HumanMOOC, which is an open online course about humanizing online instruction–how to make online courses feel engaging, connect students to the instructor and each other, etc. Here’s the main course page on the Canvas network, and here’s a more “open” version of the general topics and activities of the course, on Word Press. This week, one of the activities is to try out Voice Thread. They had created a set of slides, and invited participants to comment on them using Voice Thread (free account to comment on already-created presentations), using either audio, video, or text comments. I found myself frustrated right away with a couple of things. 1. I’m in a coffee shop, the wifi is not that great, and I kept getting kicked off the wifi. It was difficult to move through this program with spotty wifi! 2. I was looking at the embedded version of the presentation on the course website, and found it very hard to deal with. The text comments only have one or two lines visible, and you have to scroll to see the rest; but the scrolling is so fast that you can’t really read it smoothly. See screenshot below (I blacked out names and faces, b/c I haven’t asked permission if I can post them here! When I blacked out one of them it inexplicably turned into a star!). You can see how there are just a couple of lines visible and you have to scroll down to see the rest. Turns out this is solved if you go to the “full screen” option at the top left. You can actually see the whole comment! Turns out this was fixed when I went to full screen as well. Good to maybe highlight these issues for students and tell them to use the full screen view. Otherwise, it seems like a good tool! It plays through all the comments one by one, automatically, but you can pause them if you want. The audio and video comments seem to work just fine (so long as my wifi stays up). One downside I can see is that if there are a lot of people giving comments, then it’s quite a long process to go through them all. Of course, you can just tell students they don’t have to go through all of them, but then it will likely be that it’s just the first few people whose comments get read/heard/watched. You can jump to the middle or the end easily, in the timeline at the bottom, but I expect most people would just tend to stick with the beginning ones because those start playing right away when you open up the file. It would be cool if you had the option to mix up the comments randomly for different people watching, to avoid this problem. Unfortunately, I’m not sure I could use this tool in my courses, at least not easily. British Columbia has a law, the Freedom of Information and Protection of Privacy Act, and in section 3, 30.1, it states that storage of any personal information collected by public bodies (including public universities) must be in Canada unless people give written permission otherwise. Vancouver Island University has put together a useful guide for how to deal with this law in public postsecondary institutions in BC, and at the end there is a sample consent form for students to sign. It’s quite an affair to do, though, because you should to present students with the privacy policies of the tool, what could happen to their information (whom it may be shared with), and more. Plus, if one has many, many students in the course, it’s quite a pain to deal with getting all these things back and making sure everyone has filled one out. And then, what do you do about those who don’t agree? Need to come up with an alternative. And since you have to have an alternative anyway, it’s just easier not to use the tools that store personal information outside Canada! Many educators are frustrated with this law, but it doesn’t look like it’s changing any time soon, unfortunately. Why does it exist? I’m told it started with the Patriot Act in the U.S., and British Columbia not wanting identifiable information to be shared by its public institutions with the U.S. unless the individuals had given informed consent. I could use this tool if it had a way to log in and post anonymously. Or maybe people could make up a fake name and a fake email address, but that’s rather a pain for the students! Apparently, though, one university in BC has integrated Voice Thread with Moodle (see presentation here), so it is at least possible…but I think they had to go through a fair bit of work to get that to happen, and I don’t see anything about Voice Thread and UBC when I do a web search. Hmmmmm…. 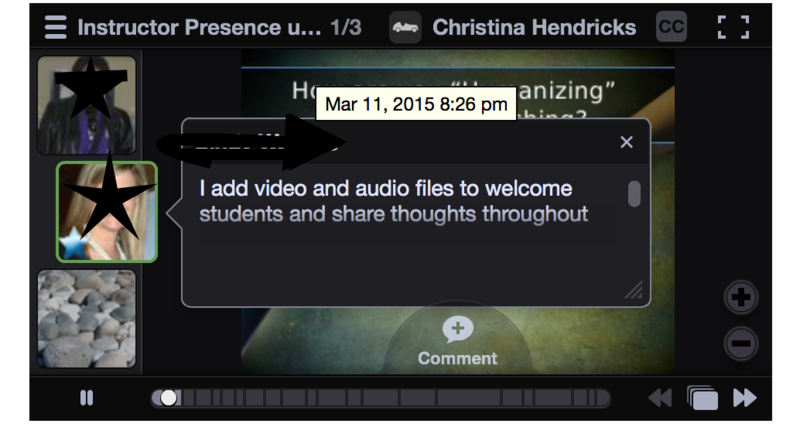 Posted in Blended/Flexible Learning and tagged #HumanMOOC on March 22, 2015 by Christina Hendricks. In one of the sections for this week there was an example of an instructor who asks students to come up with questions about the course material and submit them to the instructor, who then chooses questions based on the learning objectives and adds more if necessary to make sure all the learning objectives of a particular section of the course are covered. She then asks students to work together to answer these questions in groups. I think this is a great idea, to allow students to both seek help on things that they are having difficulty with, and also come up with questions that test others’ knowledge. So I’m going to do a version of that. This activity will take place both face-to-face and online, through the following steps. 1. 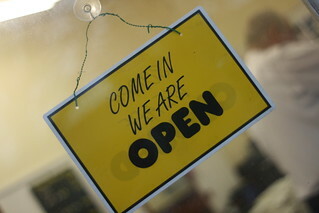 First, you will need to generate some questions on your own that you would like to ask other students in the class. Write down at least two questions and bring them to class with you on [date]. 2. On [date], you will meet in your small groups in class, face-to-face, and share your questions with each other. If there are questions that involve things that some students aren’t sure about, discuss together what you think the answer might be. Then, together, the group will choose two questions that they want another group to answer. Again, these could be questions about things the group isn’t sure about themselves, or about things the group thinks they know, but also believes are likely to be challenging for others. Write these two questions down and submit to Christina at the end of the activity (or submit on the course website if someone has a computer with them). Also submit the questions that you wrote down yourself and brought to class (can also be submitted electronically on the course website). 3. Christina will choose among the questions enough for each group to have one to discuss that they themselves have not written. She will distribute these to each group online, in the group’s discussion area. From [date] to [date], each member of the group should contribute to a discussion of a possible answer. You’ll need to come to an agreement on an answer by [date]. Your group should post your answer on the course wiki, under your assigned question [give URL for where to type in the answer, here]. 4. After you’ve answered the question assigned to your group, go the question on the wiki that your group originally asked and see what the other group said. Each group member should also comment on that group’s answer to your group’s question: do you agree/disagree? Anything to add? To make your comment, just write your name under the other group’s answer and make your comment after your name. If you disagree, explain why. If you agree, it’s best if you can do more than just say so; say if there’s something in that group’s answer that is particularly helpful, such as the way they explained something, or an example they gave. If you have anything to add, of course, add it! I decided to try to create a collaborative activity that combined both F2F and online aspects, as I’m trying to connect these two aspects of the course as much as possible. I thought about adding another F2F element after part 2, above, where they discuss their group’s answer together before posting it, and I still think that pedagogically that might be best; but I decided that this activity was starting to take up too much time of the class already! I worry that the questions won’t be the right kind to allow for substantive group discussion. The instructor who did this activity originally asked students to pick questions that address the top levels of Bloom’s taxonomy, and I could do that, but I’m not sure how much time I want to spend in class explaining the taxonomy. Maybe that wouldn’t be too difficult and would help to solve this potentia problem. There is also the perennial worry about group work that some students do very little and others do a lot. I tried to address this by having the mark not be given to the group as a whole but to individual members based on their individual contributions. That’s largely due to the nature of this activity–it doesn’t involve a major group project that one might want to give a significant mark to, and it lends itself pretty well to judging individual contributions. Students may not want to publicly disagree with another group’s answer to their question. I’ll have to think about how to handle that situation. It’s not easy to be anonymous on the UBC wiki, as each edit is attached to your name and anyone can see who made the edits. One option is to move this to a discussion board on which one can be anonymous, rather than typing in answers on a wiki. It’s just that with the wiki it’s so much easier to see all the questions and responses at once, in one place, on one page. Posted in Blended/Flexible Learning and tagged Introduction to Philosophy, PHIL 102, T-BLE on July 27, 2014 by Christina Hendricks. I’m currently taking a blended learning course (face-to-face and online) on teaching in a blended learning environment. As it all takes place on a closed university website, I’m posting some of my posts on that course here on my blog, so I have access to them later. There are numerous challenges I can think of in designing a course or section of a course to be “blended.” I’ll just mention three of those here, the ones I’m most concerned about. Have you developed strong links between the activities face-to-face and online so that the compliment each other? Will your students be able to clearly see how your face-to-face and online activities connect to each other? I think because I am so new to all this I am imagining that this might be difficult. So far we haven’t been asked to say which module, exactly, we might be redesigning, but I’ll imagine that it’s one focused on Epicureanism. The active learning activity I talked about in Activity 2 asks students to re-read a section of text, try to outline the argument individually, then work in groups to outline the argument, then look at the outlines of other groups and decide which they think works well (maybe more than one). So that would be part of the F2F activities for that module. If some of the online activities are reading the text and watching some short videos of lectures on that text, then the online and F2F activities could be connected because the arguments they’re outlining in class are from the text they have just read and heard a bit about. I will also be doing some demonstrations of outlining arguments F2F, and students will also be practicing in groups online, so the argument outlining will be done both ways (F2G and online) and thus connected. But this is just one F2F activity for a module on Epicureanism; I need to think of more. 2. Coming up with F2F activities that are not too repetitive, so we’re not doing the same things over and over F2F throughout the term. What we usually do F2F class, besides me lecturing, is talk in a large group or small groups about their own views of the philosophers’ arguments. For example, what Epicurus says about happiness is something that most students disagree with (the greatest pleasure is the tranquility of absence of pain and desire, we shouldn’t fear death, and it’s better to live with simple pleasures rather than extravagant luxuries), so there are often some good discussions. I would like to think of something for them to do besides just engage in small group discussion on whether they agree/disagree and why. This is good, but it can get old after awhile. I also often ask each student to sign up for a day during the term in which they are responsible for asking questions for their small group to discuss–about the readings, the lectures, anything related to class content. This is a similar activity, but the questions are raised by the students rather than me. Debate of some sort: small groups come up with arguments for their “side,” then one group on a side gives an argument, and any group on the other side counters. Then if there are no counters to that, one group on the second side gives their argument, and someone from the first side counters. Etc. I haven’t thought too much about how to do debates in class, so I expect there are better ways! Live like an Epicurean (or a Stoic) for a day and write about what it’s like–write a reflective piece on what you’ve learned by doing so, and whether your view about the philosophy has changed as a result. Okay, this is not a F2F activity, but we could share our experiences F2F. For a module on Socrates and his trial, I could ask them to cast votes on Socrates’ guilt and then Socrates’ punishment, and then compare this to the number of jurors in his trial who actually voted for/against him and who voted for death or not. Also, come up with other things Socrates could have said in his defense if he had wanted to live. Given what we’ve learned about what philosophy is/what philosophers do, come up with a list of people who might be said to be philosophers, or who engage in philosophical activities, and say why (then remind them later that they should include themselves!). Write these on a shared document that is posted in class, such as a Google doc or the UBC wiki. Or they could use Pulse Press to give the names and a quick explanation, and I could ask for more explanation orally. I’m quite worried about this. Right now all my lectures are given in class, so if I move some of the lecture content to videos (for example), then ask them to do online quizzes about lectures and/or readings, then have the same amount of in-class time as before, this just adds more time to the course for the students. Now they’re doing more work outside of class, taking more time, and still having the same amount of in-class time. Before blending this course, I just ask them to do readings outside of class. Doing readings, plus quizzes, plus videos adds a fair bit. I’m not sure what to do about this besides cut down on the F2F time. That seems the most straightforward solution to the problem–take extra time out of class, then take that time off the F2F time. But I don’t know how easy it is to deal with that bureaucratically. I could cut down on the content in the course, which i need to do anyway (I always have too much and can’t delve as deeply into things as I’d like…so cutting is necessary regardless), but the problem of time still remains: I’m asking them to take up more time outside of class while still having the same amount of time in class. I’m really not sure how to deal with this problem. I suppose if I only ask them for a little reading and a little video watching before class, then it’s not too much more outside of class than before. So I suppose drastically cutting content might work. But there’s only so much I think I can cut while still keeping the course how I’d like. Posted in Blended/Flexible Learning and tagged active learning, T-BLE on July 20, 2014 by Christina Hendricks. I’m participating in a professional development course at UBC called T-BLE: Teaching in a Blended Learning Environment. It’s a three week course in July 2014 that combines two face-to-face meetings with numerous online components, and is designed to introduce instructors to blended learning (mixing online and face-to-face components). We will be focusing on a particular course of ours that we want to work on changing (I think we’ll be making just one “module” of a course into a blended one rather than a whole course–there’s not enough time in a short three weeks to do a whole course, probably). It is being conducted in Blackboard Connect, so not visible to anyone except participants in the course. But in order to have my own contributions and work be in my own possession rather than only in BB and then have it disappear when I’m done, I’m including most or all of my posts for that course here on my blog. I won’t include my comments to others because they won’t make sense without the original post! Just what I post myself that makes sense on its own. The course officially starts July 7, but there were a few pre-course activities we were asked to do. I edited this a bit just to include why I’m taking this course; no need to record who I am, here! While I was on sabbatical in 2012-2013, I participated in numerous open, online courses, and had very positive experiences with things like synchronous webinars, asynchronous communications on blog posts and discussion boards, and the like. Then when I got back and started teaching in my usual way, I found myself wondering: why am I spending most of the class sessions giving a lecture that I could just as well have recorded and placed online? What value added is there to having me in the room if all I’m doing is lecturing? Of course, I also do other in-class activities, Q&A, etc., but I wondered if I could send more time doing those things if some of the lecture were moved out of the classroom. That’s my general motivation for being here, to explore what options there are for doing some of the class content online and some F2F, and what makes most sense to do when we’re all in a room together, to make the most of that time. I have asked to teach a section of Introduction to Philosophy in the Summer of 2015 in order to give me time this year to plan it as a flexible learning/blended learning course. This also means it will have fewer students than the usual 100-150 or so, and when I’m doing something quite new to me like this I find it helpful to start a bit smaller when possible! Introduction to Philosophy is a first-year course that does not have any prerequisites or assume any prior knowledge of philosophy. This course is not required for majors, and the department doesn’t have strict rules as to what must be included; however, there are three “types” of this course and each one has a particular focus. PHIL 101, Intro to Philosophy I (one term long) is meant to introduce students to metaphysics and epistemology in some way; PHIL 102, Intro to Philosophy II (one term) is meant to introduce students to value theory (e.g., ethics, social and political philosophy, and/or aesthetics). Students can take both of these courses, in any order, or just one of them (or none, as they are not required for anyone). Alternatively, they could take a year-long course, PHIL 100, that covers all of those areas in one course. My understanding of these courses is that they are meant to give interested students a taste of what philosophy is all about, and to engage them as much as possible so they might consider taking more philosophy courses (or not…at least having some exposure is good!). As a “philosophy of happiness” course–what have philosophers said about happiness? Most recently, I created the course around the theme: what is philosophy, what do philosophers do, and what is the value of any of this? What have philosophers themselves said about this? What have philosophers used their philosophical work to DO? I think this version worked the best out of all of them. Here is a link to my most recent course website. Students were also blogging on this site, but I took the students’ blogs off the site after the course was finished, because I didn’t ask their permission to keep them up there! This course is usually 3 hrs per week: 2 hrs of lecture, 1 hr of discussion section (groups of 25 students per section, usually led by TAs). In the past, I’ve used those two hours of “lecture” time to both lecture and engage students in in-class activities like small group discussions, writing answers to questions on a group document such as in google docs, engaging in debates, and more. I plan to use a tool like Poll Everywhere or Learning Catalytics to make my lectures more interactive, to have students give answers to questions, etc. I am not planning to use Clickers because I’m not sure I’m going to be using them enough in my course to justify the expense to students. When I have taught this course during the winter terms, enrollment has ranged between about 80-120 students, though sometimes it’s a bit more. In the Summer it will probably be around 45 students I think, maximum (unless I get a TA, in which case it will allow more). During the winter terms I usually have 2-3 TAs or so, running the discussion sections and marking some of the essays. Much of the assessment for the course is based on essay writing, though some of the essays are quite short. I scaffold the essay assignments so they learn to write an essay in small steps. There is also a final exam which is partly essay questions. I’m not quite sure yet, as I’m still in the early planning stages. I’m thinking it would be good to have more time in-class for things that really take advantage of us all being in a room together, which lecturing does not always do (unless it’s interspersed with interactive activities). So one idea is to put some of the lecture content online and ask them to read/watch videos before class, then use more of the class time for activities. What those activities will be I’m not entirely sure. And I have to be mindful not to just have this mean that students end up doing more work, having to take the time they would have spent in lecture in class and add it onto their out-of-class activities. I’ll have to cut down on some of the latter to avoid this problem. I just met with an instructor who recently did a kind of flipped classroom approach, and he suggested that if students could use the class time to work on a larger project, such as a group project, that would help them see the in-class activities as beneficial. So the in-class activities could be small steps needed to work towards finishing a larger project, for example. I think that’s a good idea, though I’m not sure how I’d implement it in my course. It’s just something I’m thinking about. That’s all I’ve got so far! Where is your course on this blended learning diagram? Where would you like it to be? Asked students to use a Twitter-like program at UBC that allows them to ask/answer questions synchronously during lectures (few did so, but that was a few years ago and maybe I’ll try again). I used “Pulse Press,” a theme on UBC Blogs to do this, since there may not be very many students who have Twitter accounts. Use a tool like Poll Everywhere or Learning Catalytics to be like clickers (but I’m not ready to ask them to use Clickers yet b/c i’m not sure I’ll use them enough to justify their expense). These would be activities that are not attached to a mark for the students, since I wouldn’t be able to track participation and not everyone may have their own devices needed to participate. Some team-based learning sessions–maybe not a whole course made out of TBL sessions, but one or two in a course. Where I would like my course to be by the end of the workshop: I’m hoping it’s closer to “Blended Active Learning” on the chart, though maybe I’ll just have started on the road to that by the time this course ends and will have to finish going down the road on my own. But that’s okay–there’s only so much you can do in three weeks! I am considering moving towards “Blended-reduced class time” because I want to avoid burdening students with extra work by moving some of the lecture material to outside class time. One way to do that is to reduce the face-to-face time. I would like to at least explore how one might do this, and whether a case can be made for it in my department. I don’t know what the bureaucratic hurdles might be for having a class meet less than 3 hours per week but count for 3 credits for a term. Posted in Blended/Flexible Learning and tagged flipped classroom, lectures, student engagement, T-BLE, use of class time on July 3, 2014 by Christina Hendricks.